Faculty from North American conservation programs who are engaged in instructing graduate courses focusing on preventive conservation strategies for collections are sharing curricula, resources, and topics for student research for the first time. With support from the Getty Conservation Institute and a boost from Prof. Hannelore Roemich at the Conservation Center, Institute of Fine Arts, NYU, faculty and alums met in New York in November 2014 to lay the groundwork for these exchanges. The next meeting will take place just prior to the Association of North American Graduate Programs in Conservation annual meeting in April 2015. Students in the UCLA/Getty Program in the Conservation of Archaeological and Ethnographic Materials, and students interested in collections stewardship from the Department of Information Studies and other fields, together enroll in a course entitled “Environmental Protection for Collections in Museums, Libraries and Archives.” This course involves students in a review of environmental and biological agents of collections deterioration including light, temperature, relative humidity, pollution, and insects and fungi. Students perform monitoring to identify agents and to gain an understanding of material sensitivities and protective methods available for collections. Of increasing significance within all types of collections are preventive, or passive, rather than interventive, or active, methods of preservation. Collections preservation measures are often designed to limit energy use and therefore also contribute to environmental sustainability. In this course, while research topics are proposed for a required paper, students are encouraged to pursue topics that align with their individual interests. What follows are abstracts of research papers completed by students enrolled in the “Environmental Protection for Collections” class during fall 2014. Student research projects in preventive conservation from the art conservation programs at Queen’s University and the University of Delaware are also accessible. Research from students in other North American programs, as well as curricula and teaching resources, will eventually be made available online. When exhibiting collection material, lighting environment must take into account both the fading properties of material and the lighting parameters required for visitors to read the material on display. This can pose a number of challenges when collection material includes fugitive dyes. When modern daylight fluorescent materials are present, there is an added challenge due to the instability of these molecules and the broad spectrum of light potentially required to fully observe their fluorescing properties. This poses interesting questions regarding the exhibition environment of these pigments as UV filtration is a common method used to preserve material from fading during exhibition. This raises the question of whether UV filters have a noticeable impact on the readability of fluorescent pigments? What properties must be considered in the safe exhibition and storage of daylight fluorescent pigments? Fluorescent colorants are found on virtually any substrate as dyes, inks, or pigments within a resin or lacquer, and either applied to the surface or mixed into the substrate as seen in plastics. Daylight fluorescent colorants are added to many products today and have been used within fine art since 1960s pop art movement. They are also found in modern ethnographic works, particularly laundry “bluing” brighteners applied as colorants to traditional materials. These pigments can be found in collections, and as modern material continues to be accessioned into the future, conservators and museum professionals may find an increasing number of collections material including daylight fluorescent colorants. The Photographic Activity Test (PAT) was developed by the Image Permanence Institute to explore the suitability of housing enclosures for photographic materials and is specifically a predictor of long-term interactions between enclosures and photographs. The photographic activity test can be performed on paper or plastic and the results of the test indicate whether the enclosures contain harmful chemicals that will cause image fading or staining over time. The test consists of two components: a test to detect image fading resulting from harmful chemicals in enclosures and a test to detect staining reactions between enclosures and gelatin. The photographic activity test is now an international standard, ISO18916:2007, and is highly regarded as a selling point by manufacturers of archival and storage products. According to the Image Permanence Institute, the PAT will assist in the elimination of storage materials that may augment destructive consequences that might arise in a less than perfect storage environment. One of the most dangerous and prevalent problems encountered in collections of paper-based materials is contamination by mold. Due to the nutritive properties of cellulose for all fungal species, once an outbreak takes root, it can be difficult to contain. Historically, chemical fungicides have been used in addition to other methods that can be very hazardous to workers due to their toxicity. These methods are also increasingly known to be hazardous to the collections they are meant to protect, especially paper. Fungal species are also known to become resistant to chemical fungicides through adaptation, so it is increasingly likely that they will eventually cease to be effective. An alternative that has started to gain interest in research for the integrated pest management of cultural heritage collections is the use of natural products derived from plant sources such as essential oils or extracts of their active ingredients, medicinal plants, and spices for use in preventive scenarios that also incorporate other measures such as environmental controls. Research into their use for remedial treatments is also of interest, though so far it has been difficult to find effective applications that do not put objects at risk. This paper will review the research that has been conducted recently about integrating natural methods into pest management for fungal species, and will evaluate an anecdotal account of traditional Indian practices from an Indian conservator and how these methods might be tested for more widespread use in collections. In addition to preventing harmful exposure to toxic chemicals for both workers and the collections, these methods could find potential applications for culturally sensitive collections that cannot be exposed to chemicals, anoxia, or other methods that would interfere with the cultural significance of the material. Light Emitting Diodes (LEDs) are semiconductor devices that use electrical currents to produce visible light in the form of photons. LED technology has been advancing in recent years, rapidly outgrowing the traditional incandescent and fluorescent light sources to be one of the most cost and energy efficient light sources on the market. 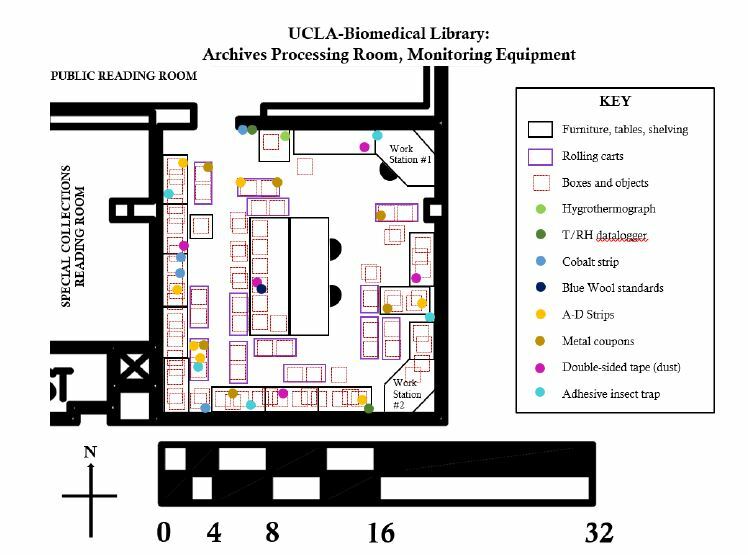 This paper will first examine this research into the efficacy of LEDs, citing studies by the Getty Conservation Institute and the U.S. Department of Energy, and following will be a discussion, involving multiple case studies, of the potential benefits of incorporating LEDs into Library settings. This paper will address the use of LEDs for exhibition lighting in two cooperative definitions of sustainability; the first is that which supports financial stability for an institution, while the second considers this technology as a component of a system which incorporates a social mentality, the physical equipment, and managerial techniques that encourage an environmentally-conscious preservation model. In order for cultural institutions, such as museums, to ensure their long-term sustainability, exhibition factors must be considered that ensure both the viability of the organization as well as the stewardship of significant objects. Museums house and care for these items, and in turn share them with the local community or a community of researchers who value their preservation and accessibility. Policies must be established to allow artworks and artifacts to be displayed in an environment that is suitable to be viewed by patrons while bearing the costs of their exhibition. Since its inception in 1839, the field of photography has continued to evolve both aesthetically and technically. The past few years certainly have seen advancements at an exponential rate in this area, especially with the commercial availability of digital photography. Consequently, digitally printed photographs are increasingly becoming the normative output for photographers and artists working with photographic methods. As such, it is important for museums, archives, and libraries, together with the conservation and photographic communities, to be able to address concerns regarding the storage and display of digital prints as part of their role as cultural institutions. Indeed, technological developments in digital photography are taking place on a daily basis and will continue to do so into the foreseeable future—an ongoing shift that must also be anticipated and take into consideration. Nevertheless, this paper focuses on the effects of temperature and relative humidity on digital photographic prints, particularly within the context of cultural institutions. As a visitor it may be hard to conceptualize external factors that can effect a museum’s collection. A museum’s responsibility for the object begins once the object has been acquired into the collection. Conservation of an object however is not limited within the walls of the conservation lab but needs to be considered throughout the entire museum space. Once in the museum, objects are susceptible to pest infestation, biological growth, and deterioration due to fluctuation of temperature and humidity. The scope of this paper is to discuss previous and current approaches taken to eradicate pest infestation and biological growth as well as introduce a potentially new and safer alternative. Chitosan is a naturally occurring polysaccharide that is produced from chitin and can be found in many organisms such as crab shells and shrimp. The use of the polymer includes applications in the food industry as antibacterial agents, in the pharmaceutical field for drug delivery systems as well as new medical advances. Chitin and chitosan can be useful in the conservation field for object preservation. Archivists, librarians, and historians desire to document, save, and preserve the past. Some ephemera, like newspapers, have an original intent that was not meant to last long periods of time, yet these items are kept and preserved to the best of archivists’ and preservationists’ abilities. One other such example is trend forecasting books and predictive reports. These books are used by the fashion industry to predict what silhouettes, colors, fabrics, and styles will be the most popular in upcoming seasons so designers, manufacturers, and retailers can successfully sell items that consumers want. There is a need to preserve these books in terms of their documenting costume history, popular and street culture, and how the fashion industry has evolved from an elusive, designer based industry to a global communication of style, technology, and individualism. There are many concerns when physically preserving these books that are not unique or unrelated to the preservation of other artifacts and books. However, due to the multimedia nature of trend forecasting reports, many considerations must be taken into account. Several cave systems in France and Spain house some of the earliest known examples of painted surfaces in the world, and since their discovery have attracted major public interest and visitation. The environments of these caves are extreme, characterized by nearly total darkness, stable temperatures, high relative humidity and low amounts of organic nutrients. The organisms that are able to survive in these conditions are highly specialized, and the ecosystems they comprise are subsequently susceptible to change. In this regard, no development of hypogeal environments to accommodate tourism can be considered minor, although the obvious examples of excavation, construction of pathways (even elevators) and installation of air conditioning systems were common practice. When one considers that Lascaux, in Southern France, and Altamira, Spain, two of the most extraordinary cave art sites in the world, hosted respectively 1,800 and 3,000 people per day at the zenith of their visitation, , the irreversible effect on these delicate systems is hardly surprising. Both Lascaux and Altamira suffered the misfortune of being discovered before management, preservation and scientific communities with an enlightened understanding of these deleterious effects existed, and they must all now play catch up to mitigate the sites’ deterioration. Museum loan policies exist, in part, as a way for museums to ensure that the materials that are loaned out to other institutions will be cared for properly and will return in the same condition in which they departed. One important facet of museum loan policies is the set requirements for museum environments, which establish, among other specifications, explicit levels of temperature and relative humidity to be maintained by the borrowing institution. However, there are many differing perspectives on best practice for implementing standards for museum environments, many of which are based on historical research findings and experience. In fact, “over the past 100 years, both research and practice in the area of environmental standards for storage, loan, and exhibition of museum collections have produced rather bewildering results, from oversimplified formulas to complex, yet incomplete research findings” (American Institute of Conservation, n.p.). Currently, there continues to be much discussion in regards to the rigid parameters set for museum environments, especially in the context of loans, and some conservation and museum professionals have begun to call for a change toward not only more flexible environmental standards, but more transparency on the part of museums about their current practices. As a result, the International Institute for Conservation of Historic and Artistic Works (ICC) in collaboration with the International Council of Museums Committee for Conservation (ICOM-CC) recently released a declaration for new environmental guidelines, which promotes both transparency of and flexibility for environmental conditions in loans policies. While the tight parameters established for environmental conditions in loan requirements have historical roots, the debates taking place in the current landscape of museum policy have called for these new changes in international standards. Spices, Exotic Flavors & Medicines, a digital exhibition put on by the History Special Collections section of the Louise M. Darling Biomedical Library at UCLA, incorporates digitized images of the four volumes of Robert Bentley and Henry Trimen’s Medicinal Plants; being descriptions with original figures of the principal plants employed in medicine and an account of the characters, properties, and uses of their parts and products of medicinal value (hereafter referred to as Medicinal Plants). With such an interest in the Internet exhibition, demand for a twelve month physical exhibition of the volumes has arisen, leading to an examination of the public reading room in which they are to be displayed, as well as of the volumes themselves. The results have led to the following observations and recommendations, with the desire to successfully exhibit the four books without compromising their preservation. Microorganisms have the ability to affect archaeological sites not only aesthetically, by covering surfaces with different colored ‘patinas’, but also chemically by producing corrosive acids that attack surfaces. Methods in the past to control and reduce the growth of microorganisms have included their removal mechanically and the use of biocides. These techniques however are intended only to remove existing growth and will not prevent future growth. The use of biocides can be detrimental to archaeological sites if they are not completely rinsed away and leave residues on surfaces. Biocides may also be toxic to the individual who applies the material, as well as to the environment. Recently, new strategies to control the growth of biological activity on archaeological sites have been developed using specific wavelengths of light. A brief overview of previous work on the subject and a discussion about their potential use follows. Alternative building materials like aluminum composite materials (ACM), entered the market addressing these concerns and offering an inert construction material safe for indoor environments and the collections held within them. However, the question arises: Can such materials so carefully manufactured to be lightweight, strong, weather resistant, water proof, heat resistant, fire resistant, formable, nitrogen/chlorine/sulfur-free, with low VOC emissions, also be safe for the environment at large in terms of their manufacture and disposal? Further, are corporations spearheading the fabrication of safe and archival exhibition cases, like The Small Corporation, maintaining environmentally conscious objectives in their manufacturing processes? Margaret Holben Ellis, Christopher W. McGlinchey, and Esther Chao, “Daylight Fluorescent Colors as Artistic Media,” in The Broad Spectrum (London: Archetype Publication Ltd, 2002), 160–67. Nancy N. Odegaard and Matthew F. Crawford, “Laundry Bluing as a Colorant in Ethnographic Objects,” in ICOM Committee for Conservation, 11th Triennial Meeting in Edinburgh, Scotland, 1-6 September 1996: Preprints (James & James (Science Publishers) Ltd., 1996), 634–38. Shaheen Fauzia. 1995. “Application of Kanja Seeds (Pongamia glabra vent) for the control of Museum Insects.” In Biodeterioration of Cultural Property 3: Proceedings of the 3rd International Conference on Biodeterioration of Cultural Property, July 4-7, 1995, Bangkok, Thailand, (Office of Archaeology and National Museums. Conservation Science Division, 1995), pp. 567-575. Bastian, Fabiola, et al. “Impact of biocide treatments on the bacterial communities of the Lascaux Cave.” Naturwissenschaften 96.7 (2009): 863-868. Schabereiter‐Gurtner, Claudia, et al. “Altamira cave Paleolithic paintings harbor partly unknown bacterial communities.” FEMS Microbiology Letters 211.1 (2002): 7-11. The digital exhibition can be accessed at http://unitproj.library.ucla.edu/biomed/spice/index.cfm; Robert Bentley and Henry Trimen, Medicinal Plants; being descriptions with original figures of the principal plant employed in medicine and an account of the characters, properties, and uses of their parts and products of medicinal value (London: J. & A. Churchill, 1880) . Koestler, R.J., Koestler, V.H., Charola, A.E., Nieto Fernandez, F.E. (Eds), 2003. Art,Biology and Conservation: Biodeterioration of Works of Art. The Metropolitan Museum of Art, New York. Uhde, E., and T. Salthammer. “Impact of reaction products from building materials and furnishings on indoor air quality—A review of recent advances in indoor chemistry.” Atmospheric Environment 41 (2007): 3111-3128. Satlhammer, Tunga. “Emissions of Volatile Organic Compounds from Products and Materials in Indoor Environments.” The Handbook of Environmental Chemistry 4, Part F (2004): 37-71. Categories: Courses | Tags: preventive conservation | Permalink. 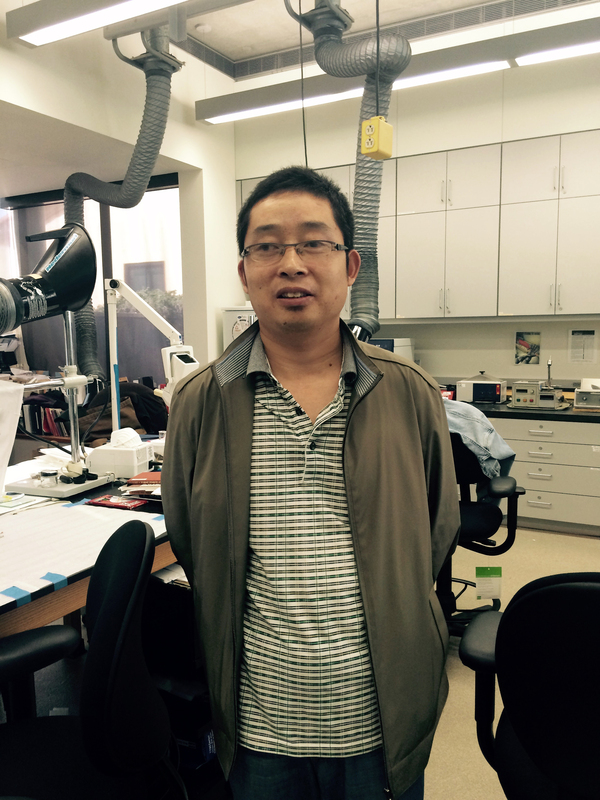 The UCLA/Getty Program welcomes visiting scholar Dr. Guofeng Wei, who will be working with us through January 2016. Dr. Wei comes to us from the Department of History, Anhui University, China. He received his Ph.D. in Scientific History and Archaeometry from the University of Science and Technology of China. His current research focuses on the recipes and crafts of historical lime mortars of China, as well as a study on the application of traditional stick rice-lime mortar in conservation of cultural relics. More recently, he carried out research studying the trace element characteristics of copper prills in slag from Tangjidun sites of copper smelting dating back to the late Shang Dynasty (ca. 1300 BC) in Anhui Province. In addition he is studying the casting technology of bronze vessels dating from the late Shang Dynasty to Spring and Autumn Period (ca. 1300BC – 470 BC) from Zongyang County. Dr. Wei will be providing lectures for some of our programs courses, as well as conducting his own research while he’s here. He is currently giving two lectures on ancient metallurgy and metal casting in the course Conservation Laboratory: Metals II (CAEM 239). Categories: Visiting Scholar/Lecturer | Tags: China, metallurgy, mortars, visiting scholar | Permalink.